I have some eyebrow issues, too. I once rocked the Brooke Shields look, and now, I am saving what I can, even the white ones, for fear of them thinning any more. I know a woman who had eyebrows tattooed on, and I can’t see me resorting to that, but help, I want my eyebrows back. And I want them one color, please, preferably not white or clear. If you pluck the white ones, don’t three replace the one? Isn’t that one of those old wives tales? I don’t know, my friend. I think I would rather see white hairs than the pencil. Thank you for your eyebrow style input Jimmy. I will take it to heart. But watch out for those old wives…they’ll tell you some pretty crazy things! I am glad you enjoyed and thank you! Don’t give up while you still have breath! Oh boy, is this familiar. Yep, I’m plucked like a chicken some days. Sigh. @E. Stelling, I hear you. I’m at the stage where hair grows everywhere but where it is supposed to. Hair in my ears? WTH is that about???? Oh my! I haven’t gotten quite that far down the road yet! Good times coming for sure! Blasted hair: always having a mind of it’s own. Wishing for the days when all I had to worry about was “bad hair days”. Glad you enjoyed my rant! Oh no, try eyebrow threading perhaps? Stop plucking; just makes it worse! 🙂 Threading! Ok! Another possible weapon! Too funny! 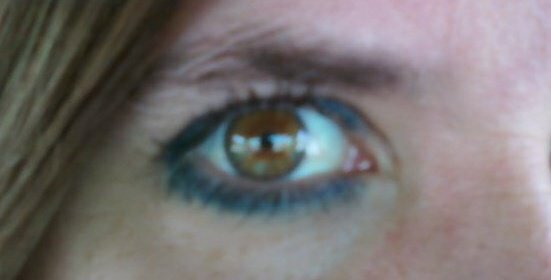 I’m now 45 and nary a silver or white has suddenly appeared.. at least not in the eyebrow area! The rogue whisker perhaps… but that’s another matter entirely! I do occasionally get my eyebros waxed… not too thin.. but to save me from those that have a mind of their own. The brazen woman actually asked me if I wanted my moustache done at the same time! What moustache? It sent me into rather a dither and promptly propelled me to take a survey of passersby to see if they could see what I did not. Thank heavens! I was pleased with the results! Yay! Santa has stopped by my blog! 🙂 So if you can bleach those things, I should be able to darken them if they get too crazy. Good to know. What an excellent job you have! You could get them tinted as and when. I get mine waxed but got no grey ones..yet, although I have some on my head which I will probably colour soon. Nice story though! Hope it works out for you! Thank you Debbie. We’ve got to keep all of our hair in line! I am very good at denial. Bad hair day? Pretend it looks great. White wild eyebrows? I get the brows waxed and pretend they magically went away. Works for me! Embrace the grays. They’re merely tokens ofvthr daily wars we fight. “ofvthr” has an exotic ring to it 🙂 . I like your philosophy.